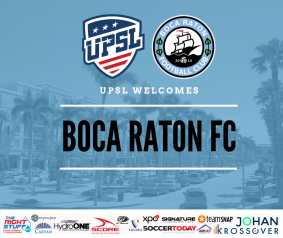 LOS ANGELES - Feb. 19, 2019 - PRLog -- The United Premier Soccer League (UPSL) is pleased to announce Boca Raton FC as a new league member kicking off with the 2019 Spring Season. Based in South Florida, Boca Raton FC will begin UPSL play in the Southeast Conference Florida South Division, and will host its UPSL home games at Atlantic Community High School (2455 W. Atlantic Ave., Delray Beach, FL 33445) and South County Regional Park (South County Regional Park, Boca Raton, FL 33498) in compliance with UPSL's Minimum Standards. United Premier Soccer League Southeast Conference Florida Division Manager Christian Vallejos said, "We are excited to welcome Boca Raton FC to Florida South Division. Boca Raton FC has proven itself on the field and is looking for a better way to showcase its talented players. Club President Douglas Heizer is committed to developing players and that's the bedrock of our league. We think Boca Raton FC will be an excellent addition to UPSL Florida and wish them the best of success moving forward." Founded in 2013, Boca Raton FC began play in the Florida-based American Premier Soccer League (APSL) in 2015 and won the league's championship that year. The club currently is on hiatus from the National Premier Soccer League (NPSL) Sunshine Conference following its second season since entering in 2017. Douglas Heizer is President and Director of Soccer Operations of Boca Raton FC. Heizer is an entrepreneur and Founder of Heizer Corp., owners of Boca Raton FC and the Boca Raton (Fla.) Tribune, a local media outlet. Boca Raton FC President and Director of Soccer Operations Douglas Heizer said, "We have players that are ready to play, and the UPSL will give us the right platform for our players because the main goal of our club is to develop and move players on to real professional clubs. The UPSL is the right competition for our players to show themselves. This isn't our academy players. These are going to be our best players because we're going out there to win this competition." Jim Rooney, 50, is Head Coach Boca Raton FC. A native of The Bronx (N.Y.), Rooney is a former professional player who scored 21 goals while playing 11 seasons with three different teams in Major League Soccer (MLS). Boca Raton FC participated in the 2016 and 2017 Lamar Hunt U.S. Open Cup tournaments, and has routinely broken attendance records for soccer in Palm Beach County (Fla.). Boca Raton FC is an American Soccer club currently based in Boca Raton, Fla., and a new member of the United Premier Soccer League. Boca Raton FC will play in the UPSL Southeast Conference. Founded in 2013, Boca Raton FC can participate in the qualifying rounds for the Lamar Hunt U.S. Open Cup through their affiliation and membership with the UPSL, the U.S. Soccer Federation (USSF) and the United States Adult Soccer Association (USASA).